When we think of the key figures of early American history, we think of explorers, or pilgrims, or Native Americans—not cattle, or goats, or swine. But as Virginia DeJohn Anderson reveals in this brilliantly original account of colonists in New England and the Chesapeake region, livestock played a vitally important role in the settling of the New World. Livestock were a central factor in the cultural clash between colonists and Indians as well as a driving force in the expansion west. Settlers believed that Indians who learned to keep livestock would also advance along the path toward civility and Christian faith. But colonists failed to anticipate that the animals they hoped would convert Indians instead generated friction as Indians encountered free-ranging livestock at almost every turn, often trespassing in their cornfields. Moreover, concerned about feeding their growing populations and committed to a style of husbandry that required far more space than they had expected, colonists could see no alternative but to appropriate Indian land. This created tensions that soon reached the boiling point and it established a pattern that would repeat time and again over the next two centuries. A stunning account that presents our history in a truly new light, Creatures of Empire restores a vital element of our past, illuminating one of the great forces of colonization and the expansion westward. A most original, gracefully written, and thoroughly fascinating exploration of Colonial history. This is not a work just for woud-be specialists. 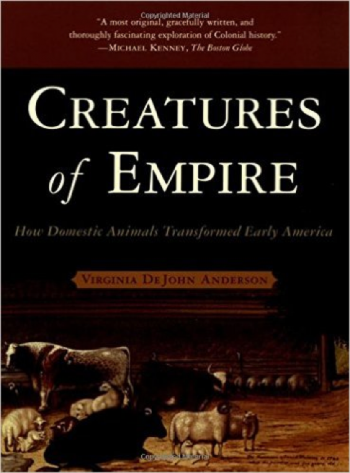 By emphasizing contingency and the role of livestock as actors in specific historical events, Anderson has demonstrated that animals should concern all historians of early America. This fine book delivers on all counts. Anderson deftly moves beyond standard environmental histories into new and richer territory. This book is a well-researched, well-written, and powerfully synthetic study of an intriguing facet of early American history. Anderson’s book is necessary reading for anyone who wants to understand colonial history. She has, in my estimation, read all the relevant original sources, assessed them wisely and written her opinions in clear and sometimes eloquent prose.